Sorry, cooler? No. I meant, hotter. 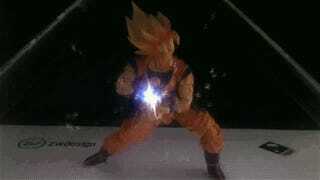 Using a Dragon Ball Goku figure and a clear pyramid, Brazil's ZW Design created this impressive hologram effect. If you are interested in how effects like these are made, YouTuber RimstarOrg has a helpful walkthrough.